Some time ago, Hope n' Change announced our intention to initiate "Good News Fridays" in which we would report only the positive, uplifting stories in the news. This didn't really catch on, though, because it's easier (and more pleasant) to pan for gold in a cesspool than it is to find good news lately. • Starbucks has announced plans to open a location in Ferguson, Missouri. After critics lambasted the coffee franchise's "Race Together" initiative and pointed out that Starbucks locations are highest where people are whitest, the company's CEO has announced that there will soon be a store in 70%-black Ferguson. In furtherance of promoting racial dialogue, the baristas will be encouraged to explain to the patrons why a "damn cup of coffee" is unaffordable. • Showing that some agencies can actually show fiscal responsibility in Washington, the IRS is receiving Congressional attention for their thrifty decision to gut their customer service budget. Sure, it meant that the previously horrible customer service actually descended into being "abysmal," according to the head of the IRS - but with the cash saved, the agency was able to give generous bonuses to employees who showed special skill and initiative in mission-critical tasks like destroying hard drives. • Excitement is building about the upcoming human head transplant surgery which, if successful, will finally realize mankind's oldest dream: being able to graft your head onto the body of someone who lived a healthy lifestyle and did all the working out that you couldn't be bothered with. The donor body for the experimental surgery has not yet been selected, but Joe Biden is said to be leading in the early write-in votes. • Hillary Clinton, who is running for president on a platform of ending mean-spiritedness in our lifetime, has issued a clarification about her previously reported statement that she wants to "topple the one-percenters." Actually, it turns out that the eternally fundraising (and frequently blitzed) Mrs. Clinton said she wants to tipple with the one-percenters. Bottoms up, Hil! • Proving that substantive, hard-hitting journalism is still alive, tonight ABC will air a two-hour interview between Diane Sawyer and Bruce Jenner, in which the former Olympian will finally get some things off his chest. Well, not his chest exactly, but trust us - things are coming off somewhere. Among the questions the nation wants answered: following surgery, will the one-time pole vaulter be keeping the leftovers in a "pole" vault? And there you have it - every iota of good news we could come up with. And frankly, it all still looks like undigested corn. In an increasingly dangerous world, it is critically important that the United States Marines remain the roughest, toughest asskickers on Earth. Unfortunately, what's even more important - at least in the eyes of the Obama administration - is to make sure that women can qualify for Marine infantry officer positions. Currently, there's nothing stopping women from getting those positions except for one niggling detail: they can't do the job. Specifically, out of a group of 29 female Marines who recently went through the Marine Infantry Officer Course, a grand total of none, nada, zip, zilch, zero passed. In fact only four of the women even made it through the first day's combat endurance test - which is pretty discouraging when one considers that some wars take even more than a day to fight. But as the old saying goes, "When the going gets tough, make it less tough for the girls." Or at least that's the old saying which seems to be guiding Army General Martin Dempsey, the nation's top military officer, who has said that if women can't meet the physical requirements for combat, it's up to the military commanders to either prove those requirements are really and truly necessary or lower the standards. Put another way, those damn sexist Marines will have to prove that their long-established standards of physical excellence and endurance are actually more than simple misogyny. After all, who's to say that it's better to be able to carry a wounded comrade to safety rather than just having a good cry? The administration's goal is to eventually have a military which is completely "gender neutral," much like the new bathroom in the White House. Failing that, they'll apparently settle for a military which is gender neutered. The few. The proud. The confusing. 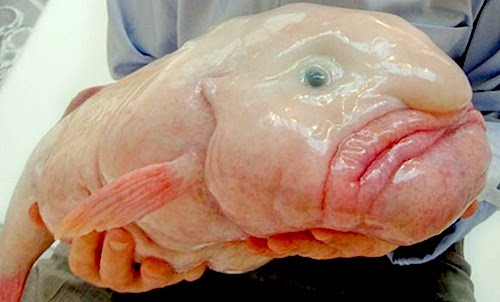 They say that if you give a man a fish, you'll feed him for a day. If you teach a man to fish, you'll feed him for a lifetime. And if Michelle Obama forces a school to give a kid a revolting chunk of gelatinous fish for lunch, you'll feed the Internet. At least, that's what happened when a Virginia mother's photo of her child's school lunch went viral on social media. 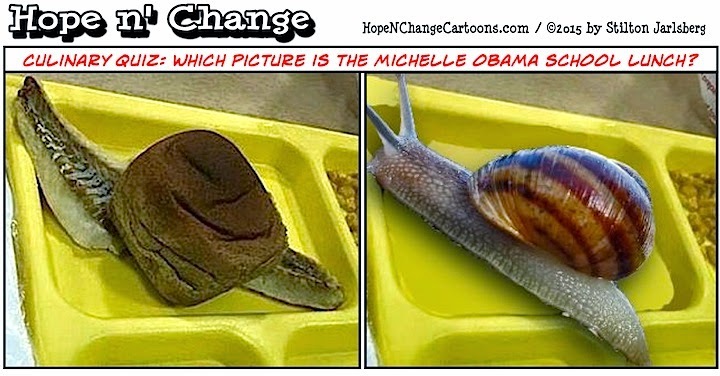 While the lunch met Michelle "I grow my own yams" Obama's stringent dietary requirements, even the school's Food Service Coordinator admitted (while choking back vomit) that the lunch looked like "something that would crawl from a garden leaving a noxious, foul-smelling slime trail." Well, those weren't his exact words. He actually said "poor lighting and food presentation make this lunch unappealing." We'd guess that the "poor lighting" probably came from government-mandated CFL bulbs, and that the poor presentation occurred when the lunch lady failed to enthusiastically say "TA-DAA!" when slapping the filet-o-fail into the tray. Presumably, both the lighting and presentation were a bit better at Lupa's restaurant in New York on Satuday, where the first lady took her mother out for a five-course lunch. Since poached hagfish and grey canned corn weren't on the menu, the two had to settle for Puntarelle Alla Romana salads, then Rigatoni Alla Gricia and Strozzapreti with Sugo Finto pastas. After cramming that down, the two slurped Coda Alla Vaccinara - a rich oxtail stew. But wait! There's more! Michelle and her mom then wrapped themselves around a cheese platter before finishing up with an ice cream dessert called Tartufo, which is probably Italian for "taxpayer funded." Meanwhile, back in the land of peasants, the national School Nutrition Association's president opined that at least part of the problem of disgusting lunches can be solved by getting another government funding increase (surprise!) which will help schools "afford the foods we must serve" per the Cafeteria Commandments inscribed on the stone tablets Michelle sent down from the mountaintop. "Unfortunately that won't make students consume it," the Association's president admitted, adding that the final resting place for much of Michelle's overpriced, under-appealing meals is "in the trash." Put another way, the school lunch program is increasing costs and decreasing desired results, while literally dumping our tax dollars into the garbage. Pretty much like every other policy coming out of this administration.